In response to the post about my orange cashmere skirt, Steph A asked a question about the little thread chain I made to keep the lining fabric from peeking out below the skirt hem when I sit down. It's a great question, and led me to think perhaps I could answer it with a little video. As I had mentioned, I miscalculated in placing these chains so I needed to redo them anyway. I noticed that I said I would pull "the chain" through - but I meant I would pull the doubled thread through - to make the chain. Essentially, this is like single crochet, but you use your fingers and thread. Easy peasy. If I do this video thing again, I'll try to be a more polished performer. A few posts back, I mentioned that I had sewed a top and cardigan, and teased you with a picture of the back of the top and a mangled photo of the cardigan. So here they are again. The cardigan started life as this wrap blouse from the February, 2009 issue of Burda Magazine. Hard to believe, no? I used the back and sleeves as Burda intended but added a swingy front and a shawl collar that folds over in front. As for the matching top, it's Jalie 2682 which I think I have made 4 times now. I would have made sleeves but I ran out of fabric. So far I think the two pieces together with my orange skirt are too matchy-matchy, but I might change my mind. I'll end with a teaser: The wrap blouse is about to make another appearance, in a form more closely resembling Burda's vision, but not exactly. A somewhat prosaic title - but so long awaited! The Sewing Lawyer finally finished her multi-seamed plush orange cashmere skirt, designed for Vogue (#1324) by Donna Karan. 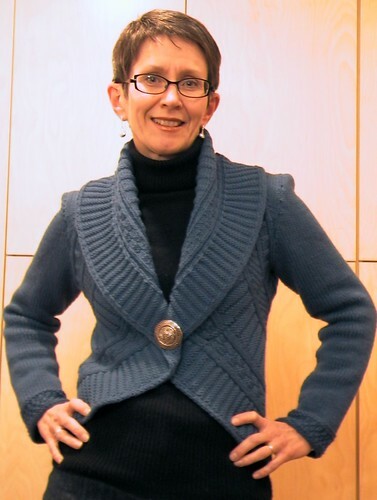 Here, I'm wearing it with the recently-completed cowl neck top from Burda 09/2012, which has turned out to be a very versatile and much-worn item. Too bad it's made from that pilly rayon knit which won't survive washing very many times. A confession - when I made the top, it was pairing with this skirt I had in mind. I think they look pretty good together. From the full-length picture at left, I hear you think "ho hum: another pencil skirt". Closer up, however, check out the construction detail and topstitching! The consensus here and IRL was that I should accentuate the positive by adding topstitching at the darts and waistband, so I did. Even though I had already attached the zipper, which made it a bit tricky. I have worn the skirt - it's narrow but not uncomfortable although one must take little, ladylike strides in it. Well, this plush fabric is, I am pretty sure, a wool and cashmere blend. It is thick enough to be a decent coat, but I only had one metre. This because my husband found the fabric at our local thrift store for (drummmmmmrolll) $1.99. Despite its provenance and price, this lush find languished in The Sewing Lawyer's stash for a couple of years while she came to terms with the fact that (a) the only upper body garment that could be made from it would be a vest, which due to its colour would only look right if worn in the forest with a hunting rifle and (b) it was not "too good" to be sewn and (c) there was enough for an orange pencil skirt which could be pretty interesting. 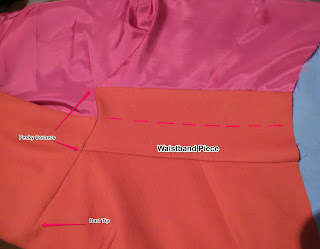 The skirt is underlined with silk organza and lined with hot pink mystery lining from stash. I used this technique to line around the vent. I made little thread chain connectors to keep the lining from peeking out below the hem of the skirt when I sit down, but need to re-do them because they are the wrong length and/or attached in the wrong place, and so allow the lining to peek out about .75cm, which is sort of cute but also annoying. The zipper in this skirt is inserted after the entire garment is sewn, and it's installed up to the top of the back waistband. A regular skirt-length zipper would be too short so I used a dress-length one, from stash. I first tried using an extra-long zipper in my black high-waisted skirt and it is so much easier to get in and out of. In this skirt the zipper opening is probably 30cm (12"). Finally, and just to prove that experience is no guarantee that no sewing mistakes will be made, I will confess that I had the entire skirt finished and put it on, only to realize that there was a very obvious problem at the top of the back vent - a drag line indicating that something was out of whack. It took me quite a long time, after totally un-sewing the back vent, CB seam and lining, to realize that in sewing the CB seam below the zipper, I had eased more fabric into the underlap side, which released just at that point and created a big bubble of fabric. I need to do more sewing. I do not want to buy more fabric. I have so much it's embarrassing. I will sew the fabric I already own. I really like it as fabric, but I think I'd like it even more as clothing. I am going to make a work jacket. Or two. 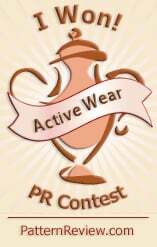 And nice dresses or separates to coordinate with them. One of those jackets is going to be in leather. I want to integrate knitted pieces into my work and home wardrobes. I foresee one or two knitted tops. It would be too depressing to actually count the number of completed garments. So I won't. Part of the explanation is that I shed approximately 10 pounds and a few inches in 2012. This led to (a) lots of altering things I had made in the past (sewing to preserve rather than create wardrobe items) and (b) having to learn how to fit the new me. I'll spare you any more complaints. On the plus side, I really like the pieces I finished in 2012. Big faves are my tweedy bouclé jacket, my turquoise dress, and my black ponte knit pants. Oh, and my black wool dress with the zipper up the back. Some of these styles were much easier for the smaller-hipped me to wear. I am also very happy with my swimsuit and my goretex pants, although these are hardly fashion statements. I tried very hard to stay away from fabric stores in 2012. I don't keep track of metres in or out but based on my possibly inaccurate recollection, I stayed pretty much on the wagon last year. Coordinates and including knitted items: Success. 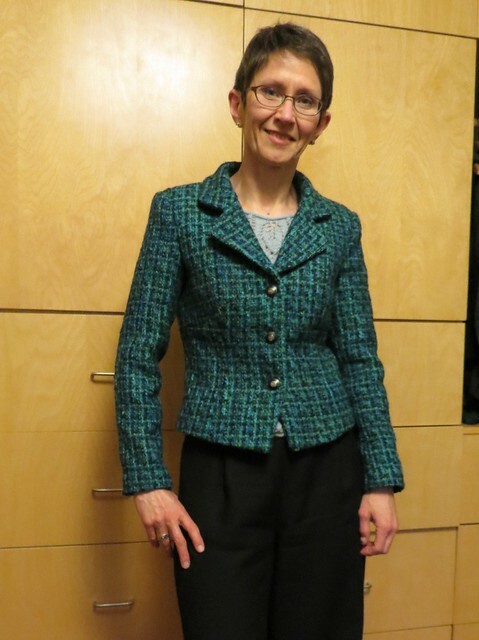 The jacket I made in March looks great with both the dresses, and the two pairs of black pants I made in 2012. I can also wear it with three of the four knitted tops I made during the year. My favourite is the one at right, with the leaf yoke top coming in a close second. Speaking of which, only one of my knitted tops (this one) is a style/colour orphan. The rest of them have slotted into my wardrobe and get worn regularly, as does the cardigan I completed in January. One big surprise for me in 2012 was that I started knitting socks. Who would have thought? I finished some yesterday and could not seem to help myself from starting another pair immediately. And on that note, what should the rest of my goals be for the year? Write here more often. I'm aiming at 5 posts per month. Sew more. Including more basics (jeans) and getting a well-fitting bra or two made. Sew the good stuff from my stash, instead of "saving" it. Unless I have something specific to "save" it for, that is. These are from Cat Bordhi's book New Pathways for Sock Knitters (Book One) which is the only book one needs to make perfect-fitting socks, in my opinion. They took a very long time because I got tired of the cables. But now they're done and I'm very happy with them. The next ones I make are going to be very plain. Don't worry, I've also been sewing and the skirt is progressing nicely. Thanks to the perceptive comments in my last post and further inspection of my muslin (in which I sewed the waistband without any difficulty) I realized that the problem was that I had basted the lining and fashion fabric together (as Vogue instructs in step 18). It is MUCH easier to sew the waistband on to a single layer. Serendipitously, doing so also means that both sides of the waistband can be clean-finished by machine. I'm always in favour of that. Why yes, that is hot pink lining. Here's a sneak peek of one side of the waistband. The lining is at top, CB is to the right. The waistband is folded along the dotted line. I managed to get all four corners just about perfect, so I'm happy. To the commenters who suggested that it would be easier if the waistband was sewn to the top of the skirt first, and the diagonal seam sewn last together with the dart, I think you were definitely onto something. Vogue instructs sewing these darts before the skirt pieces are sewn together (which I had done) but I don't see why they couldn't be left to later. I'm not usually a slave to pattern instructions and these were bad ones to follow slavishly. This is a beautiful skirt and Vogue was not kidding when they said the pattern is "Advanced/Plus Difficile". But better instructions would have been a good idea. Right now I'm inclined not to do all the topstitching Vogue is asking for. My fabric is a plush cashmere (yummy) and so far I've just topstitched (rather than topstitched and edgestitched) the major skirt seams. The stitching makes for a nice texture but the darts and seams also show up well as you can see in the picture. According to Vogue, I should also topstitch the darts and the lower edge of the waistband. Thoughts? The waistband on V1324 has me stumped. I hope it's temporary. Here is the problem. That intersection is where the waistband intersects perfectly with the angle of the already-sewn dart (pressed towards CF). The acute angle of the corner, the top of the dart and the angled "side" seam will all serendipitously meet at exactly the same point. Normally when you have to sew an inset into an existing corner the corner is capable of being pulled open (by clipping into the reinforced point). I'm reluctant to do that here, as the topstitched SA of the "side" seam continues up and towards CF. I think clipping into it would create a big structural weakness at that point. The pattern instructions are completely unhelpful. I'm seriously considering pressing all the SAs on the waistband to the inside, and applying it by hand. Does anyone out there have advice for me?